In late 1997 the City of San Francisco began the last phase of the Embarcadero reconstruction project. The Embarcadero looked nothing like it did before the Loma-Prieta quake. A beautiful tree-lined boulevard and rail system now replaced the ugly two tiered freeway. A new pier, wider sidewalks and new outdoor public spaces had also enhanced the waterfront. The site under consideration was a half-block of open space, bordered by the Embarcadero, Market, Steuart and Mission Streets. It was being developed as part of the Mid-Embarcadero Waterfront Transportation Project. 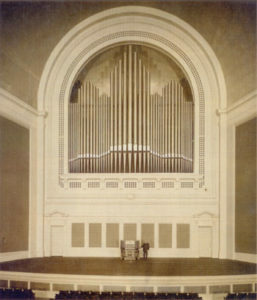 By mid-1999 the City of San Francisco had approved plans to install the Exposition Organ in a proposed pavilion at the waterfront. The project became known as the Embarcadero Music Concourse and Organ Pavilion. It would provide a large open space where downtown workers, tourists, waterfront visitors and ferry and streetcar commuters could take a break and enjoy free daily organ recitals, special concerts and even silent movies. The Music Concourse was designed to provide outdoor seating for 3,000, becoming the center for many community events. By the early 2004, a ballot measure to raise funds for the organ and several other projects had been put before voters of San Francisco. It was defeated. Also numerous businesses surrounding the proposed Music Concourse site protested the idea for a music pavilion because they feared the volume of the organ would be too loud and disrupt their businesses. The Music Concourse faded into oblivion. Determined not to let the Exposition Organ linger and perhaps be destroyed, The Friends of the Exposition Organ was formed to keep the fire alive and to safeguard the instrument from neglect and destruction.